Now for a positive story from the restaurant world. 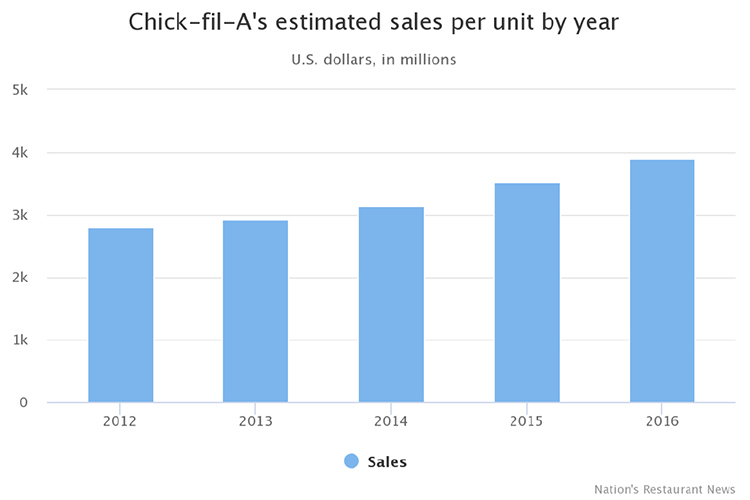 In a time where eroding traffic and sales seems like the new normal, and the entire casual dining segment is close to capitulating, along comes Chick-Fil-A. The quick service chain is growing at an awesome rate over the past 5 years. How awesome? How about 25% more stores and an average unit volume growth rate that exceeds the expansion rate? 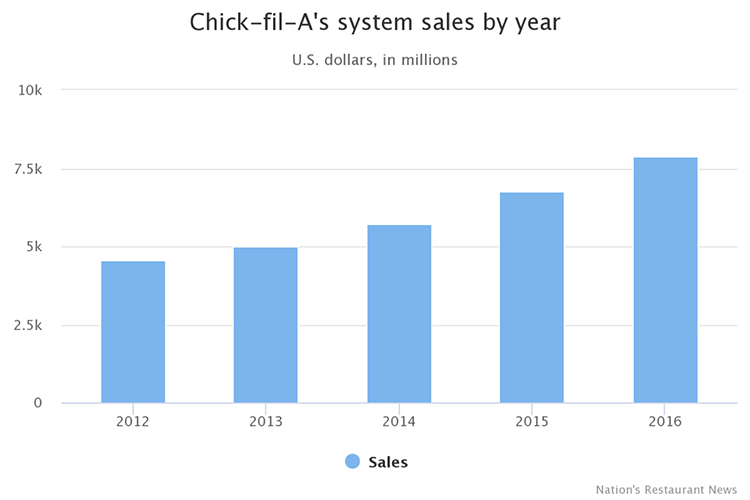 In the past 5 years Chick-Fil-A system sales are up over 70%. And that Average Unit Volume? A cool $3.9 million! McDonald’s wishes it could come close…the arches are at $2.5 million. Compare Chick-Fil-A unit volume to higher check average full-service brands that sell alcohol and they still best many of them. And did we mention they do all that by opening only 6 days a week and closing down each night to avoid the 24-hour grind? Kudos to Chick-Fil-A. Proof positive that even as the restaurant industry goes through a seismic shift in market demand, brands that are well-positioned and differentiated with solid core products, and that operate exceptionally well consistently, can absolutely dominate. What’s the Worth of a Brand?